Below you'll find a link to a video of President Trump at his rally in Michigan, where he made comments in support of H-2B. Says NALP's Paul Mendelsohn, "This is the first time that he has made public comments recognizing the need for the program during his presidency. Of course, the statement could be viewed as a policy trial balloon; he made the comments in front of an extremely pro-Trump group and quite frankly the reaction he received was lukewarm at best. Regardless, it is an important development that we thought you should know about. At a minimum, we should be able to use the soundbite to our advantage as we continue our push for short-term cap relief and permanent cap-reform." This week, many of our representatives are back in Denver. Please reach out to them and ask them for support of the H-2B visa program. Additionally, we must continue pressure on DOL and DHS to release the additional visas immediately. The video can be viewed at https://youtu.be/ooX8pufHGHg. If you have any questions about this matter or want to get more involved in H-2B advocacy, please John McMahon at 303 757-5611. The House Appropriations DHS Subcommittee is currently holding a hearing with Homeland Security Secretary Nielsen. Dr. Andy Harris (R-MD) spoke about the importance of the H-2B program. He said that DHS has already certified over 80,000 H-2B positions, which clearly shows the need is there and he mentioned that many downstream American jobs are dependent on H-2B workers. He asked when DHS will determine the number of visas needed, and how quickly it will re-open processing. Secretary Nielsen said that she will be consulting with Labor Secretary Acosta, as is required by the law, in the next few days and that a decision will be made soon, after DHS consults with a few other constituencies. She said the intention of the program is certainly not to put American businesses out of business or to hurt American jobs. She also asked Rep. Harris to work with DHS over the next year to determine the number of workers needed and said that it is hard when Congress gives DHS this discretionary authority and DHS does not have the needed data. She also thinks the seasonal division of the cap does not work and a better approach is needed and asked Dr. Harris to also work with DHS on that issue. Rep. Dutch Ruppersberger (D-MD) added his support for Dr. Harris' comments. The ALCC will continue to monitor the situation and provide updates as we receive them. There is not currently a plan for a “fly in”, but we will let you know if circumstances change. 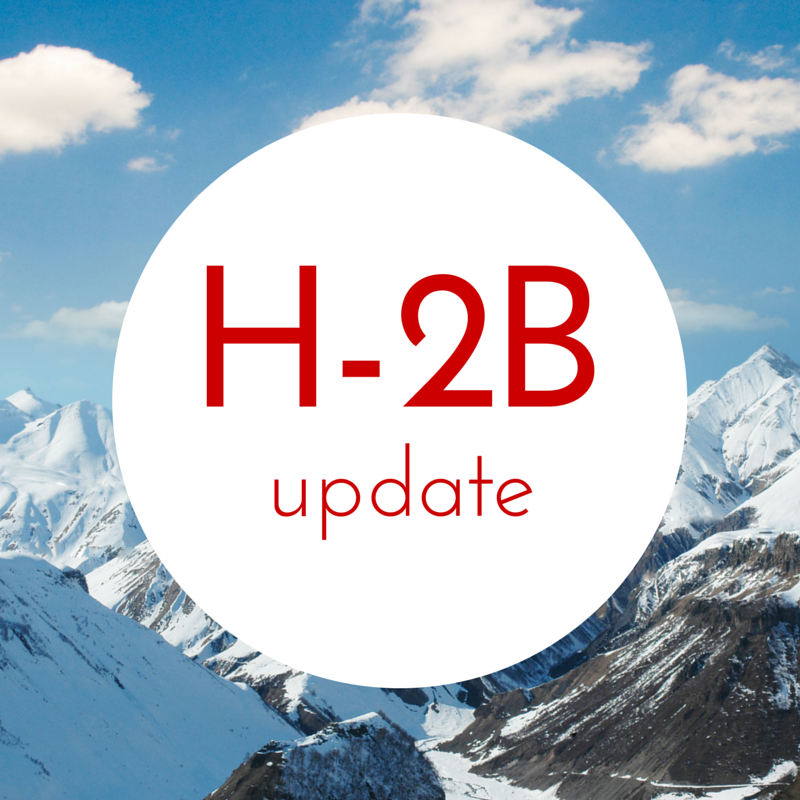 In the meantime, we are updating our H-2B data. If you have not received all your H-2B workers, please let me know how many you have requested and how many you received, plus any information regarding the impacts of not receiving your H-2B workers has on your business. As you are aware, last Friday President Trump signed into law a $1.3 trillion spending bill to fund the government for the remainder of fiscal year 2018, which runs through September 30. The legislation is similar to last year in that it gives the Department of Homeland Security the discretion to raise the current 66,000 H-2B cap by an additional 69,320 visas. There is no returning worker exemption. "All, I am sure you have heard that early this morning the Senate passed the 2018 Omnibus budget bill and the President is expected to quickly sign it. The good news is that thanks to the diligence and hard work of you and many others, the bill includes 2018 H-2B cap-relief. The bad news is that it is the exact same language that Congress included last year and that led to less than optimal results, to put it kindly. Please see the following update from the H-2B Workforce Coalition regarding H-2B cap relief in the omnibus spending bill. Additionally, view/download a statement from the coalition here. Yesterday afternoon, Congress finalized negotiating the Fiscal 2018 omnibus appropriations bill. The House is expected to vote on the measure today and Senate action will follow shortly thereafter. Congress did not finish its work last night on the fiscal year end spending bill and is meeting again this morning to finalize the details. One of the points of contention is funding for a border wall. Congressional leaders still plan to release a bill today and vote on the bill tomorrow, but final action could potentially be pushed out to the weekend. We will let you know as soon as we have any updates about the status of H-2B cap relief in a final bill. Denver's Department of Public Health & Environment has convened the Green Roofs Review Task Force to examine how best to achieve the benefits of the green roofs ordinance, while possibly expanding compliance options for new and existing buildings. The group's fifth of eight meetings is scheduled for Wednesday, March 21, 9:00 a.m. -12:00 p.m. at 200 W 14th Ave, 2nd Floor, Grand Mesa Room. Meetings are open to the public to observe. See the agenda for meeting five. Congress is close to wrapping up its negotiations over a spending bill for the remainder of fiscal 2018. We believe H-2B cap relief will be included in that package thanks to everyone’s continued advocacy and outreach. We expect that the bill will include substantial relief for two years, as well as the first permanent cap relief in decades. While the language being negotiated will not satisfy 100% of the demand for H-2B visas, it is a significant step forward. The final negotiations over the spending bill should be wrapped up on Monday. While calls to your lawmakers in your home state urging cap relief are helpful, we strongly recommend that you do not reference any specific language, which is counterproductive in the middle of delicate negotiations. Also, please do not call any Senators or Representatives beyond your elected officials. Congressional staff see non-constituent phone calls and a waste of time and not helpful. We will keep you updated on the status of cap relief in the final spending bill and let you know the details as soon as a bill is released. Congressional negotiations over the fiscal 2018 year-end spending bill, also known as the omnibus appropriations bill, could be wrapped up this week. Legislation must be signed into law by March 23. It is crucial that you weigh in with your elected officials one last time and urge them to personally speak to their party leaders about the urgent need to include H-2B cap relief in the omnibus bill. Please focus on calling your own elected officials, rather than reaching out directly to leadership offices. Call Congress on Us to Urge H-2B Cap-Relief Today! We are entering a critical stage in the fight for 2018 cap-relief. Significant progress has been made and our efforts are paying off! Despite progress, we can not let up - Congress is also hearing from anti-immigration groups who are urging AGAINST providing any additional H-2B visas. NALP has established a new TOLL-FREE calling system to connect H-2B users and stakeholders directly to the D.C. offices of their members of Congress!